The discovery of gold in eastern Oregon in the early 1860s brought thousands of prospectors through the area, and their presence soon led to violent skirmishes with the Northwest Indians. To restore peace, the federal government established several military camps in present-day Harney County before negotiating a treaty in 1869. Cattle ranchers, attracted by the vast amount of bunchgrass and the railroad available at Winnemucca, soon began moving herds into the region. While small, family-owned farms grew on the northern sections of the county, several vast cattle ranches, financed by out-of-state owners, developed on the southern end. For the next several decades, an uneasiness that sometimes erupted in violence brewed between the settlers and the cattle barons as each jockeyed for land ownership and water rights. Although the quality of some locations was poor, the federal government awarded the land grants, the promised incentive. Subsequent owners of the military road land grant recorded a 24-block plat called the "Town of Burns" in 1883. One early settler wrote that in the mid-1880s, "There was nothing attractive about Burns in those days; in fact it was as raw and crude a little burg as one can well imagine. There were two saloons, two small mercantile stores, a rough-and-tumble hotel, a blacksmith shop and a livery stable in the making." The saloons, by far the most popular businesses, attracted visiting cow-punchers and settlers, who made it their headquarters while they were in town. Burns consisted of a hotel, a saloon, and a barber shop in the early 1880s. George McGowan, a merchant from a rival settlement, soon moved to the town and started a general store with Peter Stenger. When establishing a post office, Stenger wanted to name the community after himself, but George Francis Brimlow in "Harney County, Oregon, and Its Range Land" wrote that McGowan discouraged this, observing that too many might call it "the Stenger town where they got stung." Instead, McGowan suggested the name of Burns, after Robert Burns, his favorite Scottish poet. The Burns townsite was part of a land grant given the builders of the Willamette Valley and Cascade Mountain Wagon Road, which extended from Albany to the Washoe Ferry on the Snake River. Harney County is located where U.S. Highways 395 and 20 converge. Burns is a transportation hub for the region and business center for Oregon's largest county, which is bigger than many eastern states. The 200-mile scenic byway between Burns and Lakeview traverses vast rangelands, national forests and mountain ranges. You'll see swans, deer, antelope, wild mustangs, coyotes, other wildlife, fossil beds and awe inspiring geological formations and historic sites, such as Crystal Crane Hot Springs, thunder egg fields, massive lakes, lava tubes, pit craters and cinder cones. The economy of Harney County is made up primarily of ranching, manufacturing and lumber. The spectacular Steens Mountain draws hikers, geologists and rock climbers from around the country. Annual events in the Burns area include the John Scharff Migratory Bird Festival, Obsidian Days, Pioneer Day, Burns Paiute Intertribal Pow Wow, Country Music Jamboree, Basque Festival, Steens Rim Run, Harney County Fair, Rodeo & Race Meet. The area has several community parks and playgrounds, and many other recreational facilities. Harney County is a gathering place for sportsmen and provides good hunting for elk, antelope and deer, as well as pheasants, grouse, ducks and geese. Other events throughout the year draw sports enthusiasts whose interests range from snowmobiling to rodeo. 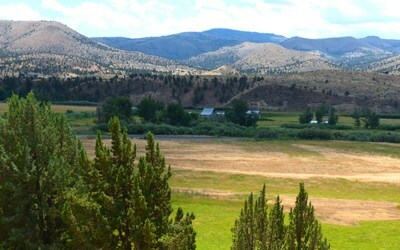 The Frenchglen Hotel, an Oregon State Parks Historical Inn, offers lodging and food in an atmosphere reminiscent of the days of the Oregon Trail. See wild mustangs run free as you drive the south end of Harney County. Diamond Craters is one of the most diverse volcanic features in the nation. 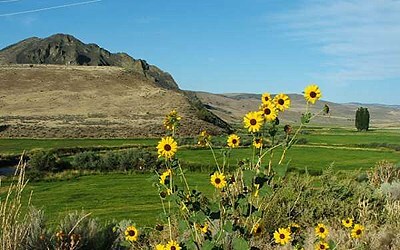 Malheur National Wildlife Refuge is a lovely place to rest your body and soul with hiking, photography and the study of more than 250 species of birds. Steens Mountains, southeast of Burns, rises gently along the Blitzen and Catlow valleys. Nature puts on her own show, and the programs are free. See how many wildflowers you can find, or go on a fishing expedition. Camping, hiking and hunting are unforgettable experiences here in the grandeur of the mountains. Just below Steens summit is a stark, but beautiful, landscape that includes seasonal playa lakes, hot springs, sand dunes and desert vegetation. In the Ochoco and Malheur national forests you'll find unusual pursuits like mushrooming and snowmobiling, unique fire lookouts and plenty of great camping.